Veterans Day has slowly become one of my more earnest holidays. This Veterans Day is the first one in which I finally hung up the uniform after 25 years. It is also the 100th anniversary to the end of World War I aka the Great War or The War to End All Wars. Veterans Day started as Armistice Day internationally in 1919, but the United States took an extra step and decided to honor all its veterans in 1954. This year, the University of South Carolina Student Government and the University of South Carolina Student Veterans Association worked together to raise money for the Fisher House in Columbia. The Fisher House is a place for military families to stay while someone receives treatment at a military hospital with duration lasting longer than a day. My son and I used the Fisher House at Fort Hood in 2002 when my wife and later my daughter were hospitalized with a serious case of the flu. We were not stationed at Fort Hood at the time, so the benefits of staying at a place very close to an Army medical center, especially for free, had its benefits. Thus I could get behind this cause. 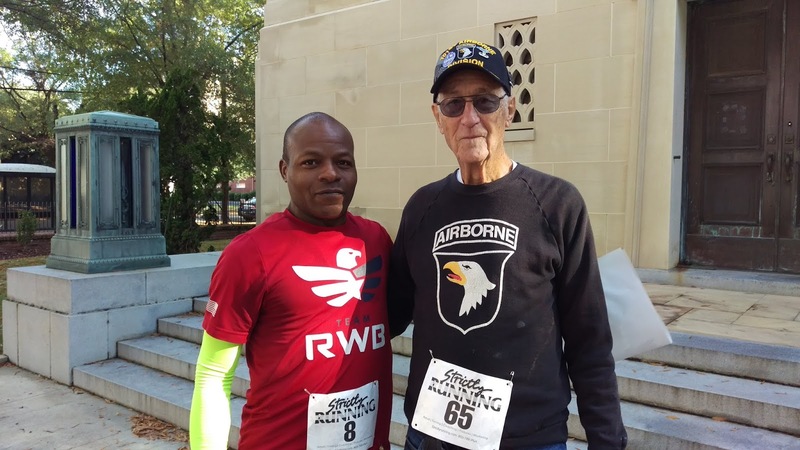 This inaugural Veterans Day 5k was their way to raise that money. However, I did not learn about this particular race until the week of the race. 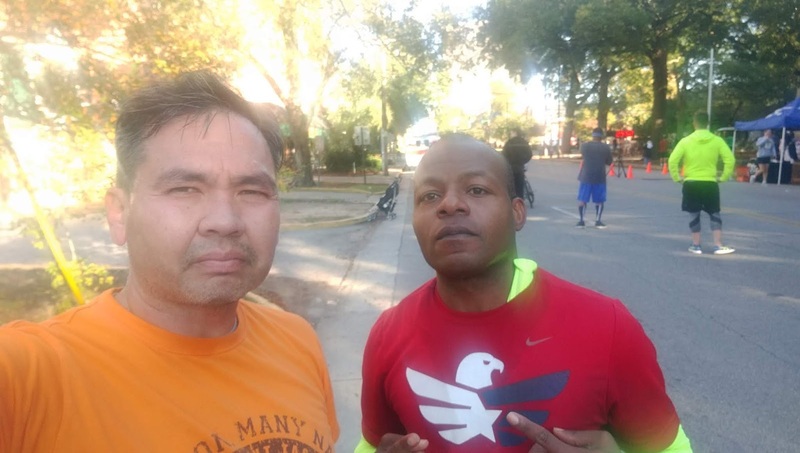 Now, this particular Veterans Day weekend contained several races with the biggest one being the Lexington Run Hard half-marathon, 10k, and 5k races, so I was pretty surprised to see over 180 runners and walkers out there in front of the University of South Carolina’s Thomas Cooper Library. When I arrived at the starting point, I saw the line for packet pick-up and registration. The line snaked and wiggled about but I eventually got to the front. The volunteers took my name but then informed me that they ran out of shirts in my size. Another volunteer heard this and quickly pointed out that they still had a box of shirts to go through, so after a few minutes, I eventually got my size large shirt. But I didn’t get a goodie bag like those before me, so I have no idea what promotional information the recyclable gift bags contained. I wasn’t upset about it, but mostly perplexed since I saw so many bags behind the volunteers. 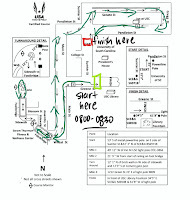 When I signed up, I had no idea what the route would be, but one of my friends had a print-out and let me look at it. This was an entirely new course for me, and I was thrilled about that. We started a couple of minutes late, but that was no big deal. Once the horn blared a couple of times, people moved across the start line. Channel 10 had a news person out there to cover the race, but somehow I missed that until a day after the event. Over 180 of us marched past the starting point and ran down Greene Street before turning onto Main Street. We had a nice half mile of a downhill slope to help. When I rounded the corner onto Wheat Street, I saw that we would go over Assembly Street via the footbridge; I’ve always wanted to run on that thing, even though it doesn’t look that special. After the footbridge, though, is where a lot of us got lost, even if it was only for a little bit. According to the map, we should have climbed up the second footbridge, but instead we ran past it and went down Park Street to circle back to Assembly Street. I followed the runners in front of me and eventually they crossed Assembly Street to get back onto Wheat Street. But without any volunteers or police directing traffic, it felt a little dangerous to do this. 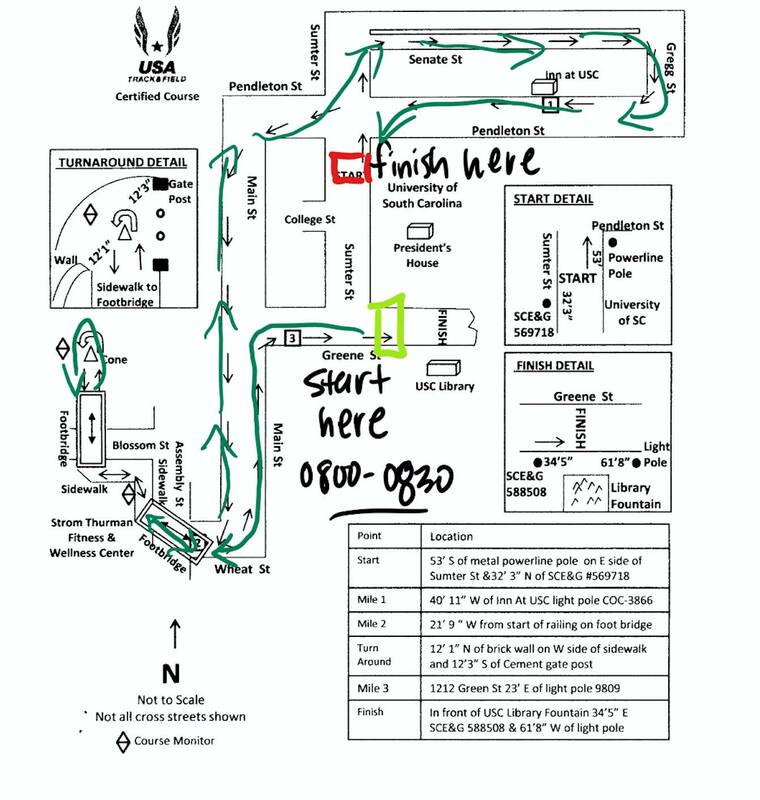 The rest of the run stayed on course with little issues until right before the finish line. 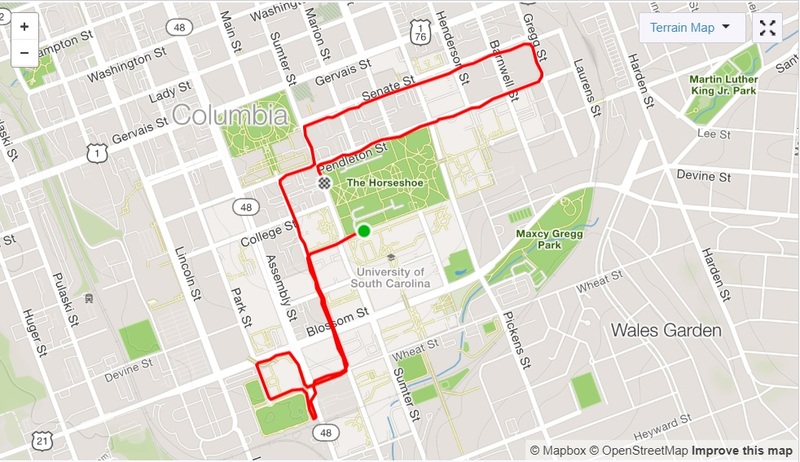 As I rounded the final corner towards the finish line, I thought a police officer yelled at me to continue running in a straight line, instead of turning. What apparently happened though, is that she tried to get the attention of two other runners who just finished the race and were walking away from the finish line; she thought they hadn’t crossed the last stop. So I spent a couple of seconds pretty confused about which way I was supposed to go because I thought the policewoman wanted my attention. Even with the misdirection at the finish line and going a different route, I did manage to run a complete 5k in distance. I wasn’t thrilled with my time since I hovered at 28 minutes. I’ve been slowly losing my running speed since I left the service, but I’ll work on that later. The awards ceremony took place just under an hour from the start of the race. During the ceremony, we watched as 91 year old Thomas Peel, a World War II, Korean War, and Vietnam War veteran, rounded the corner and pushed towards the finish line. Once the award ceremony resumed, I got a chance to see the medals. While only the top place in each division got one, the medals looked nice and distinguished themselves from other race medals by being made of wood. Before the awards ceremony, the race director acknowledged that there were hiccups with this race. It is the first year for the Veterans Day 5k and even with the missteps, the 5k race still went well. Since the head of the University of South Carolina Student Veterans Association also headed up the ceremony and asked several participants how the race went, I feel assured that next year’s race will go a lot smoother. What Is Inside A Honey Stinger Variety Pack?